GRP Grating Systems is a leading stockist of glass reinforced plastic (GRP) grating products, mainly used for non slip flooring. The non slip floor grating, constructed from fibreglass, is an ideal and cost effective alternative to traditional grating materials like, wood, mild steel or stainless steel. GRP Grating Systems’ range of fibreglass grating products can be used in a variety of different industries where safety can be an issue. Whether you are a Laboratory, School, Warehouse, Factory, Veterinary Surgery or Hospital, GRP Grating Systems has a grating system that meets your requirements. GRP gratings are supplied in various resin finishes to allow for the different applications for which the grating is intended as well as giving the customer a choice in styles and grating thickness. Fibreglass grating is formed using continuous interwoven glass fibres as reinforcement material and resin as the matrix with continuous solidification through a mould system making it a strong, durable grating system which is beneficial to all industries such as chemical, pharmaceutical, offshore and leisure. 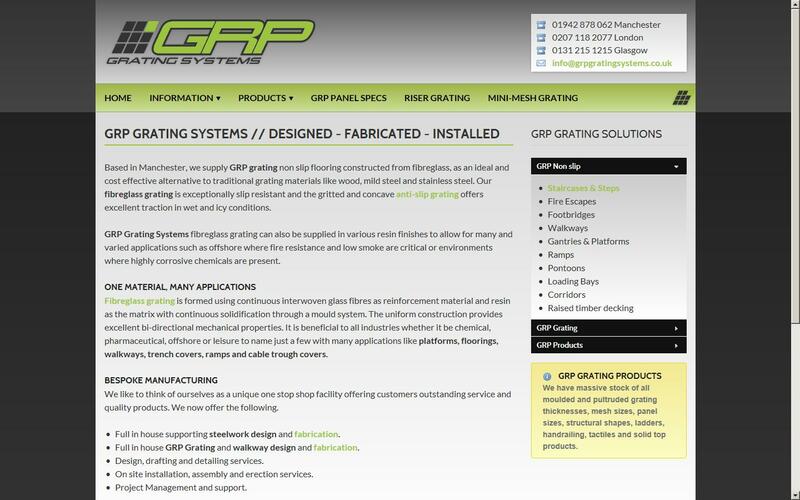 GRP Grating Systems like to think of themselves as a unique one stop shop facility offering customer’s outstanding service and quality fibreglass grating products. We now offer the following.